1284110877 -Each new print copy includes Navigate 2 Advantage Access that unlocks a comprehensive and interactive eBook, student practice activities and assessments, the full Student Study Guide, a full suite of instructor resources, and learning analytics reporting tools. Revised to keep pace with the latest data and statistics, Drugs and Society, Thirteenth Edition with Navigate 2 Advantage Access, continues to captivate students by taking a multidisciplinary approach to the impact of drug use and abuse on the lives of average individuals. The authors have integrated their expertise in the fields of drug abuse, pharmacology, and sociology with their extensive experiences in research, treatment, drug policy making, and drug policy implementation to create an edition that speaks directly to students on the medical, emotional, and social damage drug use can cause. 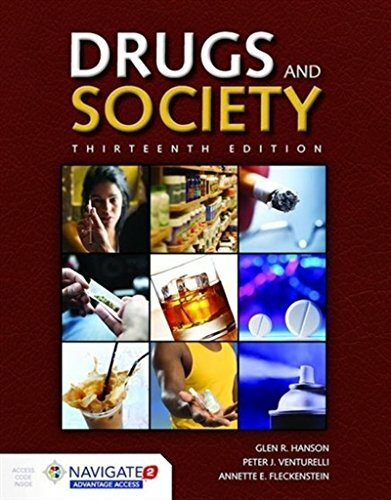 Drugs and Society, Thirteenth Edition is written on a personal level and directly addresses college students by incorporating individual drug use and abuse experiences as well as personal and institutional perspectives. Students will find these personal accounts both insightful and interesting. With Navigate 2, technology and content combine to expand the reach of your classroom. Whether you teach an online, hybrid, or traditional classroom-based course, Navigate 2 delivers unbeatable value. Experience Navigate 2 today at www.jblnavigate.com/2.